A couple of weeks ago a friend of mine posted a quote to Facebook about the habit of catastrophic thinking versus living in the moment. Some of it was sadly familiar to me; in uncomfortable situations I'm the one checking for the nearest exits in case someone spontaneously combusts, scanning for sketchy characters in a crowded subway car, wondering which of the other boats on the lake is being helmed by a frat boy who's been drinking since sunrise. As events progress I forget to worry about unlikely tragedies and genuinely enjoy myself, but recognizing this habit I try to appear nothing but calm around Anna, "Hey! Look at that boat coming right at us! They must want to say hello — let's just tighten up this life jacket." I thought I was doing a good job avoiding using fear in trying to keep her out of harm's way; when she took off and vanished at a crowded theme park, I didn't shake her and yell, "SOMEONE COULD HAVE STOLEN YOU!" though it was my brain's first, desperate output. When she asked why she had to continue taking swimming lessons instead of tap I said, "So you can learn to surf with Daddy one day" and not, "Because watching you run headlong into 3-foot waves at the beach makes me want to flagrantly defy the no-alcohol ordinance." I realized that in these bigger, more abstract situations I do okay — when we flew to Florida, I clapped and giggled during takeoff while my synapses pleaded for another Xanax — it's the small, day-to-day stuff I need to work on. The more I listened to my words the more I realized that hey, maybe this is where all the catastrophic stuff comes out. Maybe as kids we hear too much, Don't dance on the table, it could flip over. Stop teasing the dog before she bites you! Never, ever run away from me in a parking lot, you could get hit by a car! We don't play hide-and-seek in the mall, what happens if I can't find you? She's already started what-iffing. 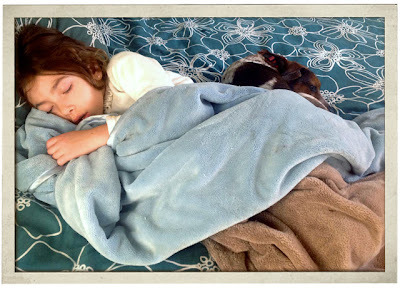 A few weeks ago, overtired and tucked in bed, she started worrying that she might lose both of her security blankets — here I toe the line between Meh, we'll just get you a new one, they make plenty of 'em! and teaching her to take good care of her belongings because her parents aren't made of money. But she kept undoing my answers, "Well, what if I lose brown blankie?" "Then you still have blue blankie." "But what if I lose both blankies?" "Then we'll go to the store and get a new one." "But what if the store doesn't have any more?" and so on. She finally fell asleep and it never came up after that. So I'm trying, since reading that quote, to watch how I warn her away from danger; how I teach her to tuck her head when she flips across the sofa, not "because you could hurt your neck" but "because that's how your gymnastics teachers want you to do it." I'll make sure she buckles up in the car "because I want you to be extra safe" and not "because sometimes people drive like assholes." On the way to school we play a new kind of what-if game. I'll start with, "Anna, what if today is the best day you ever had at school?" or "What if someone tells you how awesome you are today?" I'm trying. I may not be able to totally break the habit in me, but with any luck I can keep it from forming in her. Oh guys, I hope.